Cook Korean! : A Comic Book with Recipes, written by Robin Ha, features over 60 recipes in an interesting and unique graphic novel format. Highly detailed and colorful illustrations are used to showcase Korean culture and favorite recipes including Gamja Sujebi (Hand-Pulled Dough Soup with Potatoes), Sigeumchi Namul (Soy Spinach), Nakji Dupbap (Spicy Octopus over Rice), Tangsuyuk (Sweet and Sour Pork), and Galbi (Grilled Beef Short Ribs). Robin Ha was born in South Korea and moved to the United States at the age of 14. She didn’t actually learn how to cook until she went to Italy during her senior year of college and stayed with an Italian family for two weeks. After becoming inspired, she spent the rest of her time in Italy in group housing with a communal kitchen and learned even more about cooking. She graduated from the Rhode Island School of Design with a BFA in illustration. She worked in the fashion industry in New York City and was featured in independent comics anthologies such as Secret Identities and The Strumpet along with Marvel Comics and Heavy Metal magazine. She now lives in Falls Church, Virginia and features Korean recipe comics on her blog, Banchan in 2 Pages. The chapters are divided based on course: Introduction, Kimchi and Pickles, Vegetable Side Dishes, Meat and Poultry, Seafood, Soups and Stews, Porridges, Noodles and Rice Cakes, Snacks and Street Food, Cocktails and Anju, and Korean Fusion. The contents page also has the recipes listed under each chapter with page numbers. Instead of photos, the recipes are explained with step-by-step illustrations in a graphic novel format. Ha created a fictional character named Dengki dressed in the traditional hanbok (Korean dress) to help share the recipes. Various aspects of Korean culture are also explained including lunch boxes (dosirak), Korean barbecue, seafood- Gulbi, varieties of noodles, bunsik (foods made with flour/street snacks), Bbopki (wafer-thin sugar candy), the drinking culture (Soju and Makgeolli), Anju (bar snacks) and popular pairings, introduction of foreign foods and fusions. As a primer to Korean cooking, Ha includes a map of Korea with popular dishes, the seven key ingredients, a guide to the Korean refrigerator and pantry, and the basics behind traditional mealtime etiquette. You will also learn about the types of Bap (cooked rice) and how to best prepare prepare it. I absolutely loved Ha’s detailed acknowledgements showcasing her mother/daughter relationship. Ha drew all of the illustrations herself for every single dish. The name is each recipe is listed in English and Korean. Measurements are provided in US Customary. This is a great pick for those looking for a book featuring Korean cuisine with a unique twist. The bright and colorful illustrations do a wonderful job of showing the steps and the finished dish in amazing detail. I see this being particularly helpful for teens and young adults learning how to cook in a fun way. This book may not be the best choice for those who want actual photos of the food and scenery. There are a variety of recipes to choose from with vegetables, meat, seafood, soups, rice, noodles, sweets, and beverages. Kimchi lovers will find plenty to choose from using napa cabbage, chayote, green onion, daikon, and cucumber. Complexity of the recipes range from less than 15 minutes to others that require long fermentation times and a long list of ingredients. Having access to an Asian Food Market featuring Korean ingredients will be helpful for making many of the recipes (including Korean red chile flakes, gochujang, soju, dangmyun, dried red dates, pork belly, dried anchovies, yellow croakers, sweet rice flour, dashima, gukganjang, and more). As a note, this book doesn’t stay open easily. I had to put something heavy on the pages to keep it open on the countertop while cooking. Bulgogi Dupbap (Bulgogi Deopbap) is a rice bowl topped with marinated, thinly sliced beef. The marinade is made with a blended mixture of onion, garlic, ginger, soy sauce, soju, sesame oil, sugar, and kiwi. Asian pear is traditionally used, but Ha decided on kiwi since it is easier to find and tenderizes the meat more quickly. This meal comes together with little effort, but does require 3 hours of marinating time. The meat is quickly cooked over high heat with onions and mushrooms. It was perfectly tender and the thin cut made it easy for the kids to handle. I also loved that only one pan was needed (minus the rice cooker for the rice). I was able to find bulgogi-cut beef at a Korean food market. If you are unable to locate it, use beef chuck and slice as thinly as possible- about 1/8 inch. Freezing the meat for about 15 minutes makes cutting easier. The beef can also be substituted with chicken or pork. Soju (소주) is a distilled Korean clear liquor made with rice, barley, and potato. The ABV can vary, but averages around 20%. It can be found in some liquor stores and Korean markets, but you can substitute with sake or vodka if you are unable to locate it. I also made Bean Sprout Salad (Kongnamul Muchim), Hotteok (Brown Sugar Pancakes), and Gyeranjjim (Korean Egg in a Bowl). Kongnamul Muchim is a simple side dish (Namul) made with soybean sprouts. They are briefly boiled, then tossed with green onion, garlic, sesame, and soy. For a little spice, Korean red chile flakes can be added. It was the perfect accompaniment for Chad’s lunch with the Bulgogi Dupbap. I have made Hotteok (Korean Brown Sugar Pancakes) a couple of times before, but couldn’t pass up the chance to make them again. These delicious stuffed pancakes are filled with a gooey brown sugar nut center. Robin recommends to try the pancakes with different fillings. I definitely need to try them again with Nutella. I first tried Gyeranjjim while eating at a Korean BBQ restaurant in Annandale, Virginia with a friend. I was immediately hooked and became excited to find a recipe in this book. Gyeranjjim is a Korean steamed scrambled egg. The egg is beaten with milk and green onion before steaming in a clay pot (traditionally a ttukbaegi). I have a ttukbaegi (found it in the housewares section in a Korean food market), but you can also use any small ceramic bowl. I love how easy this was to make and the single serving size was perfect for breakfast. Steaming the egg created a light, airy texture that was a big hit with Claire. Use a paper towel to blot the beef slices dry. Peel the onion and slice in half. Chop one half and add to the blender. Reserve the other half for cooking. Add the garlic, ginger, kiwi, soy sauce, soju, 1 tablespoon of the sesame oil, sugar, and pepper to the blender. Puree until smooth. Arrange a layer of beef in a 9×13 inch container. Cover with some of the pureed marinade. Cover with more beef, then more marinade. Repeat until all of the beef and marinade is layered. Cover and refrigerate for 3 hours. Once ready to cook, slice the reserved onion half into thin slices. Cut 4 of the green onions into 3 inch pieces. Remove the stems from the shiitake mushrooms and thinly slice the caps. Place a large pan or wok over high heat. Add the remaining 1 tablespoon of sesame oil. Remove the beef slices from the marinade and add to the hot pan. Cook, stirring, for one minute. Stir in the onion slices, green onions, and shiitake mushrooms. Continue to cook, stirring, until the beef is cooked through and vegetables softened. Serve hot over rice with thinly sliced green onions and sesame seeds. This looks absolutely scrumptious! The photography is making me drool!!!! It looks so easy also. This is a dish my whole family will love. I am going to have to check out this cookbook. This is going on the menu for next week, and the book looks like a winner! What a cool concept for a cook book! 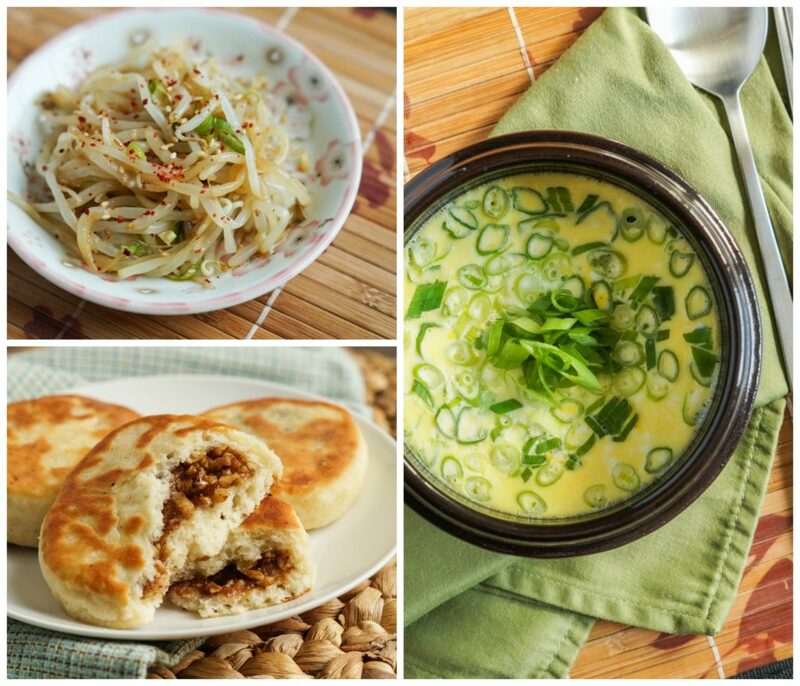 This recipe looks so good, and the hotteok, oh my gosh I want to try NOW. I love your idea of stuffing it with nutella! I love Korean food, and I’ve had my eye on this cookbook! Thanks for your review. And this bulgogi sounds awesome! Oh my gosh that cookbook sounds so fun, Stuart would love it!